As we approach the second decade in the twenty-first century, literature and pop-culture predictions are all coming together to tell us one thing: the future is now. 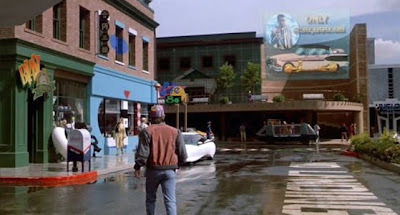 As any good film geek would know, we are only four years out from the week in October, 2015 when Marty McFly visits the futuretopian version of his hometown in the Back to the Future II. And while we may be years away from flying cars, hoverboards and power shoelaces (albeit not for lack of effort), many of the inventions showcased in the film are now part of our everyday lives: Doc brown’s “binocular card” resembles a thin digital camera, thumbprint scanners exist—albeit not often on residential homes, kitchens and restaurants are digitized, and some of our pop culture icons (read: Lady GaGa) seem to have taken a cue from the HIll Valley 2015 fashion catalogue. While it’s impossible to know which technological developments are a result of the self-fulfilling prophecy phenomenon created by movies such as this, one thing that struck me while re-watching the film was the various marketing advances in the town square, most notably the Jaws 3-D shark that startles Marty, the holographic billboard that pops up across the street advertising hover-conversion systems. Discounting the 80's VHS quality of the movie, the billboard looks strikingly like GKD's MediaMesh, shown below on the American Airlines arena. Seeing such a dynamic media installation, especially one that looks so familiar to that which was invented by set designers of twenty years ago, makes me jittery with the thoughts of our future, and where medialized technology will be going in years to come. For those of us in the business of pushing the boundaries of marketing and advertising and public relations beyond the outer realms of Hollywood's imagination, we must ask ourselves where the next phase of development is going. Should we limit our best creativities and efforts to the ever-evolving internet sphere? or should we aim to integrate the technology of the future, the technology of today, into our own "Hill Valley" town squares? As the technology continues to improve and become more widespread, I predict that facades like this will literally be popping up all over the place, from supermarket aisles to hotel marquees to residential homes--and with screens this big and this "futuristic", everyone is in the front row. I have a post it on my computer that I live by – “Create impact through design”. Each word in that statement is powerful to me. In the past, I would have focused on the word “design”, as design was a vital part of the sales tools we created. They were tactile, beautiful (there were some great ones I must say!) powerful in messaging, yet, solely dependant upon the sales force that used them. That being said, how could we evaluate the “impact” these pieces had on our audiences? I can’t count the amount of times a client has said that they struggle with the sales force. Are they communicating correctly to the audience, do they know the products, are they using the tools, how do we track results? As much as those brochures or kits had all the bells and whistles to speak for themselves, often they remained in trunks or briefcases. At the same time, many of them made them into the right hands and did their job wonderfully. But that percentage that didn’t….how could we close that? How could we reach more of our audience effectively? Previously, that was a tough one. Today, we have the opportunity to really extend the reach of our messaging and campaigns through integrated marketing and PR. To really create an impact. One that we can control. We can take that campaign, and broaden it by PR initiatives, as well as social PR. I never thought I’d get used to the idea of social PR – previously so different from the idea of design - but it has the ability to take all that we’ve created, and blast it into different mediums (we designers love recognition anywhere we can get it). Talk about reach. And, we can track it (because we all need validation that it’s a brilliant campaign). We used to launch a product with a brochure and ad. Again, very reliant on the sales force, and in regards to the ad, where did it lead them? Now, we create an ad, that drives the audience to a microsite, which in turn provides a platform for an incredible amount of information. At the same time, increases database information. If the ad didn’t get them there, how about tweeting about the campaign? Or maybe speaking up on LinkedIn? Or a bylined article? So if the brochure is in the trunk….so be it. We’ll find another way. This is the advantage of integrated marketing and PR….where the sales force falls short of reach, PR and social PR can pick up the slack and carry the message. The more integrated, the more angles of attack. Create impact through design. Design is an incredible tool, but even better when it generates a lot of impact.